A friendly high school rivalry has not prevented Jelani Day ’04 from collaborating with Westtown graduate Julee Wilson ’00 in the fashion industry. Jelani is the brand manager for fashion icon Dapper Dan, and Julee is the fashion and beauty director at ESSENCE Magazine. The two teamed up this fall to feature Dapper Dan as the cover story for ESSENCE’s September fashion issue. Jelani and Julee met through an organization called Harlem’s Fashion Row, a platform for multicultural designers, where Dapper Dan presented as a keynote speaker a few years ago. “The whole point of Harlem’s Fashion Row is to enhance not only diversity, but cultural issues as well, and provide a platform during New York Fashion week for people of multicultural backgrounds to come together,” said Jelani. “Julee was in the audience that day, and at the time she was the fashion editor for The Huffington Post. We met briefly after the show and stayed in touch. I invited her to attend a screening of a documentary that Dapper Dan was featured in with my family a few months later. We met up at a deli across from the venue and got to know each other,” said Jelani. It was in that exchange where Jelani and Julee both discovered their George School and Westtown connection. “We became fast friends and then realized that we also lived on the same block and went to brother/sister schools. It’s serendipitous when you think about it,” said Julee. Jelani is in charge of managing Dapper Dan’s brand, whose fashion designs bridge luxury brands together with a hip-hop aesthetic. Dapper Dan has been making waves in the fashion industry for years. His partnership with Gucci has propelled him further to the forefront with the creation of a fashion line and an appointment-only boutique in a brownstone in Central Harlem. The brand’s mission is built on a foundation of positivity and determination. “Dap always talks about what his mission is, which is to get young men and women, who are very capable, to get off the corner and integrate with the rest of the world in a way that they can add value and do positive things in society,” said Jelani. Dapper Dan’s story is intertwined with the Harlem community, and is also on the global stage of luxury fashion. Jelani is excited about the global reach of Dapper Dan’s brand and message, and hopes that it’s something young people can look at and feel inspired to make their ambitions a reality. 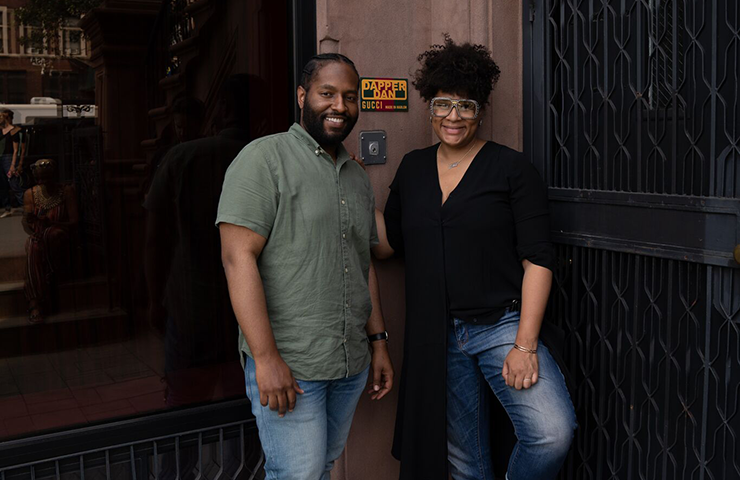 The professional relationship between Jelani and Julee is an inspiring example of what it means to cultivate collaboration across an industry. In addition to working together for ESSENCE’s September issue, Jelani and Julee also worked closely together over the summer at the annual ESSENCE festival in New Orleans, which featured a keynote talk from Julee and Dapper Dan. The pair also worked together on ESSENCE’s StreetStyle festival this past September in Brooklyn, NYC, which provided plenty of opportunities for guests to interact with their favorite fashion brands and influencers. “Collaboration is essential. You can’t do this type of work in a vacuum—it takes the talent and passion of others to create something that will stand the test of time. I’m proud to say we did that,” said Julee. There is currently a circular table in the office where Dapper Dan’s team has meetings, and each team member is asked for their input. “It’s about making people feel included and valued because they truly are. Being able to bring this element into a day-to-day work environment has made all the difference,” said Jelani.